Did you know that Kalaripayattu is one of the most ancient martial art forms in the world? The term Kalaripayattu is a compound of the words kalari meaning “school” and payattu meaning “to fight”. It is believed that the art form can be traced back to 2000 B.C. 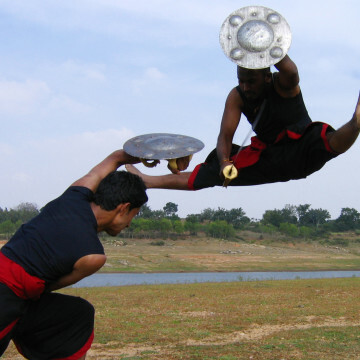 In addition, the practice of Kalaripayattu was used in conflicts between the Chera and Chola dynasties! The Kalaripayattu experience includes a 60 minute demonstration of this ancient martial art form with about six performers. The show starts with the lighting of traditional lamps, a flower offering to a deity and a brief introduction. There will be about 27 different weapons demonstrated with an explanation of each one. Do you know what we think is the coolest part? You will be able to watch and participate in this demonstration! Not only will you watch a demonstration of Kalaripayattu, but you will also participate! This demonstration will take place in a very small, intimate setting. The cost does not include pickup/drop, please arrange the same on own, if you want us to arrange it then let us know. Please arrive at Thevara ferry point in southern Kochi, by 6.30 PM here you will meet your guide who will then take you to the suburban village of Nettor. After you arrive in Nettor, you will embark on a ten minute walk through the village and reach the Kalari. The demonstration will start at 7:15 pm and will end at 8:15 pm. Remember to remove your shoes as a mark of respect when you enter the Kalari arena.